So, Sandy and I plan to have a little ceremony and party in New York City, to celebrate 25 years together. We haven’t been married all that time, but we’ve been together. It’s just going to be us, “eloping” into Central Park, then to two of our favorite spots: the bar at the Parker Meridien Hotel, and the Ear Inn in Soho. No formal wedding, invitations, or bad disc jockeys, just a quiet reminder of all we’ve seen and done together. That said, I want a bangin’ dress! My casual lifestyle in Florida never calls for a dressy-dress, but now I want one. And I’d like you to help me pick it out. At 62, I’m not up for a train and veil, and a lot of lace. 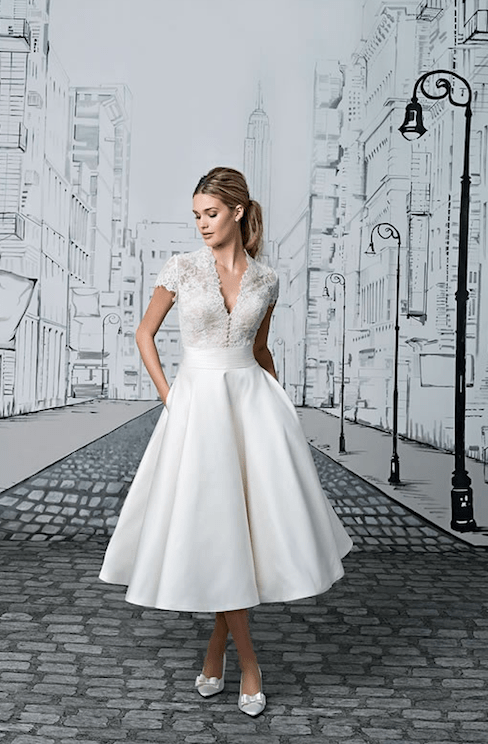 I’m looking at the classic 1950’s wedding dress silhouette as one possibility: vee neck, sleeves, and FULL skirt – you know, the kind that twirl. Here are some of my favorites from my Pinterest board. You can see all the details there. Not all of these dresses are actually still available, but they’re my guides. I’d love it if you told me your favorite in the comments! And I will let you know what I pick. I do value your experienced opinions. Have any of you done a vow renewal, or (shocking!) second wedding? This one looks more 1960’s to me. Love the sophisticated shape. The bodice has a ghost of Kate Middleton’s dress, and the skirt is smooth. I like the combination of lace and satin, and the perfect length. the right attitude for our party. Love the color too. 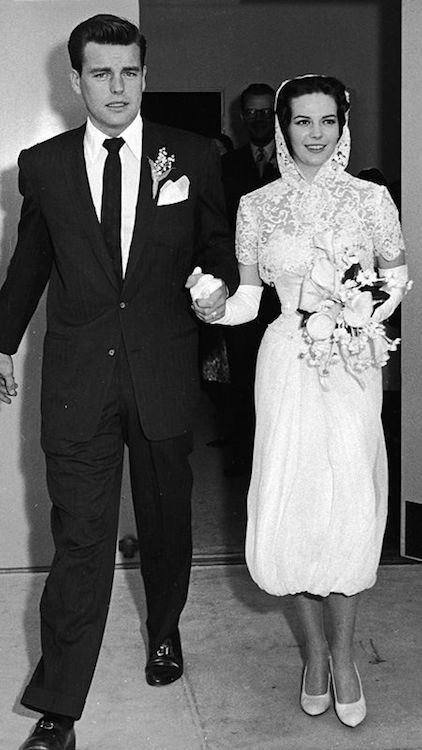 marriage to Robert Wagner in 1957. So romantic, but not over-the-top. Congratulations Patti, and have a wonderful and memorable celebration in NYC. I think the idea of a romantic getaway in your favourite city is a marvelous way to celebrate 25 years together. I think you need a full, twirly skirt – perhaps a version of the second dress, in a different colour and a slightly different neckline? A stellar idea! You will have so much fun in NYC. I’m partial to the second with its gorgeous flared skirt and the third dress. Love an illusion bodice and that contrasting satin collar really makes it standout. What a lovely way to celebrate your time together and I know how much you love NYC. I think that dress #1 is very dreamy and romantic but then #3 is sophisticated and elegant. I’m torn and I’m sure that what ever you wear will be fabulous. I love #3 but wonder what story the rear view writes? The navy accessories look lovely with the color as well. #2 is very pretty but I would do it in a cream or pale tea rose. Simply because a dress like that in white might be difficult to re purpose later…since dressing up is not part of your regular repertoire have you thought about renting a frock? You could wear the dress of your dreams without the guilt of spending $$ and having it languish in your closet? So many companies doing this now and offering designer gowns, might be worth investigating. We have celebrated 41 years, having our kids late meant those twenty fifth/30/35 anniversaries were spent with our boys. At number 40 we had a grand escape to Bill and Hillary’s favourite hideout in Québec’s Eastern Townships….no vow renewals just time together. Enjoy your day! I think they’re all uniquely beautiful but the one I actually “see” you in is #3. It has a certain sophistication and as you said, attitude. First and foremost, congratulations !! That is wonderful, and I love where you are going ! I love one and three and think you must add gloves, any color. Let us know! How very cool. I am thinking about doing something similar maybe for our 35th in 2 years. Let us know, looking so forward to the details! Would love to meet you in the city, but I know that romance comes first! Another time hopefully! If you’re looking for a full skirt, I like #2. If it was for me, I’d probably choose #3 though I would prefer it with a different neckline. My hubby and I renewed our vows two years ago on our 39th wedding anniversary, but we chose a small, intimate and very rustic setting and dressed very casually. It was perfect for us. I think you are right on track with these,this type of dress is going to be so fabulous on your slender self! I am crazy about the first one but I just love that retro feel of the full skirt and fitted bodice. My husband and I are celebrating our 23rd anniversary this year but we’ve been together 25. It’s hard to believe,time just flies when you’re having fun and you married the right person! I think an intimate vow renewal sounds amazing and so romantic! You can’t go wrong! They are all feminine and declare that something important is happening! Congratulations on 25 years with your man! That is so special. I am loving #2– the smooth pleated skirt accentuates the lacy bodice. Hair ideas? Helper hair? A pearl battery? A diamond tiara? Baby’s breath? This has got to be fun to plan! This is such a fabulous idea! I love it! All of these dresses are amazing! I can picture you perfectly in that third dress…but, I know whatever you pick will be stunning! That first dress really takes my breath away. I’ve been keeping an eye out for authentic vintage for you for this occasion but the only thing I seem to come across is full on wedding dresses. There were so many at the stores I visited today. I’m so happy you won’t need to be wearing some kind of massive flower corsage on your cast. The first dress puts me in mind of Audrey Hepburn……just cut my hair ala a young Audrey Hepburn! The second dress is a relaxed version of the first in my mind…..gotta love a fancy dress with pockets in the skirt! The third is so chic and elegant……love the rolled collar that shows off collar bones so beautifully. The fourth is interesting…..a hoodie, bolero, veil combination​? It’ll be interesting to see what you choose. I love the first dress, especially with the red gloves. I can see you really rocking that one, Patty! I think the plans for your anniversary are really sweet.